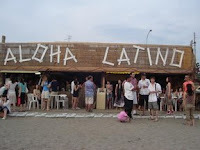 Tanabata Salsa Party @ Zushi Beach! From JR Zushi station, a 13-min walk. Artists: Alexander Laborde (Vo, Guitar), Ludwig (Percussion), Pedro (Flute/Saxophone), Kitahara (Base) and Suenaga (Tres) with guest musicians and dancers! It comes again. 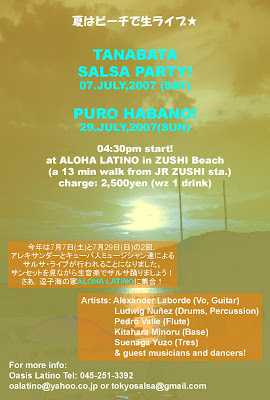 Alexander's Salsa Live in Zushi! 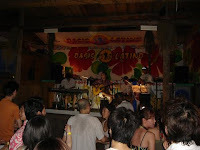 This year we will entertain you with Cuban Music in one of traditional days in Japan: Tanabata = July 7. It is a special day for a couple that they are allowed to meet only once a year. That's Tanabata. Yet, please come with a bunch of your friends, families, and neighbors and even someone you dont know! Let's dance together in Zushi beach again!